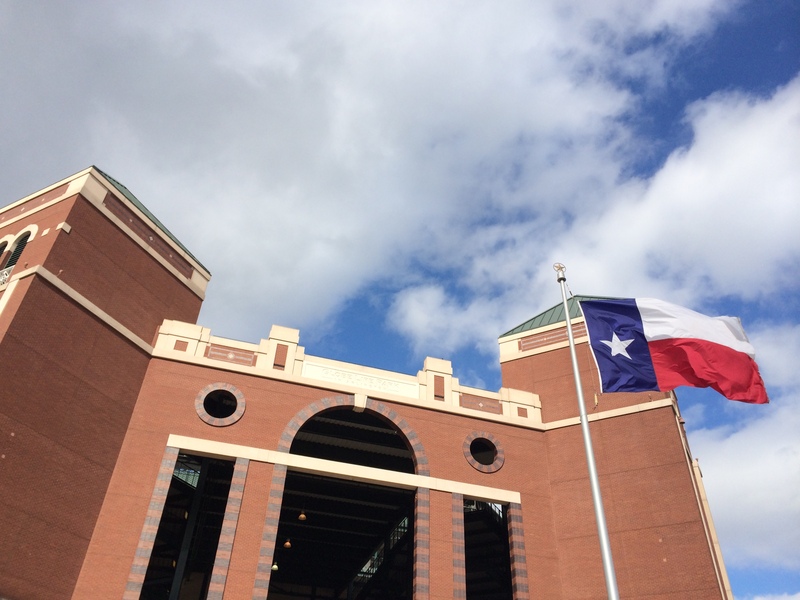 From the outside, Globe Life Park looks like more of a fortress than a ballpark. It is a massive brick structure with arched gates and peaked turrets, but it sits in the same complex as the Cowboys’ ridiculously huge AT&T Stadium so that makes it feel a bit less daunting. But don’t be fooled. 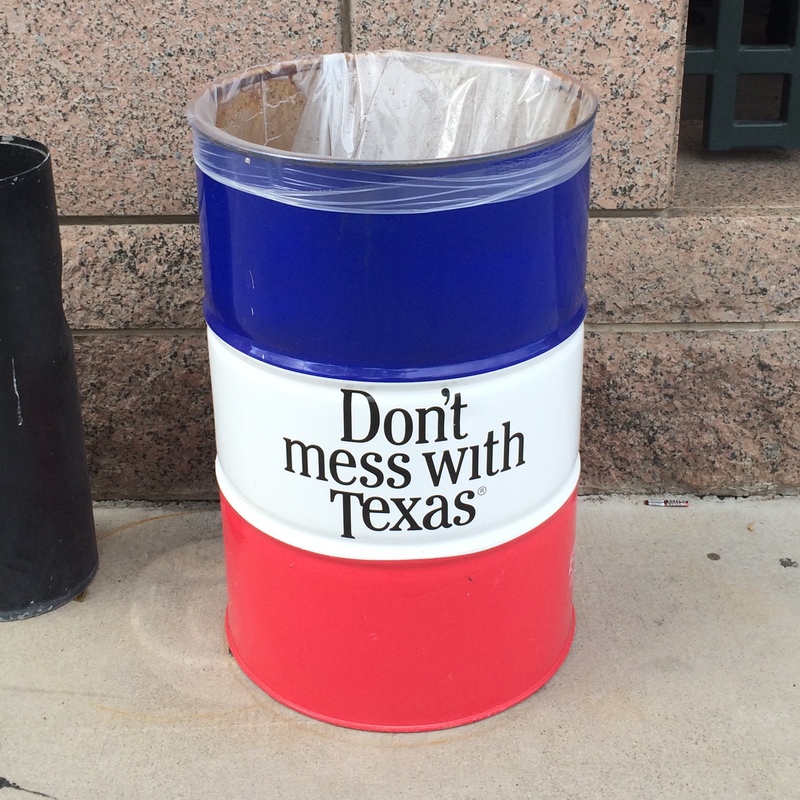 It’s still Texas, and it’s still huge. This was my second trip to the Ballpark. My last trip was 11 years ago. My family was in DFW for my cousin Ryan’s wedding, and the Royals happened to be in town that weekend too. Today, Ryan works for the fire department and he sports one of the most gnarly mustaches you’ll ever see. 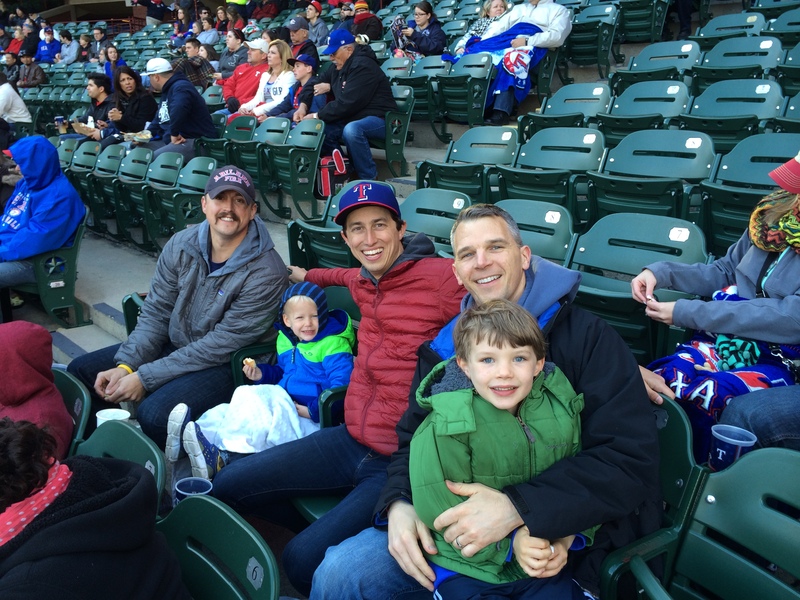 He and his family live in Abilene, TX, now, so he and his son, Graham, were able to join me for last night’s game. The Rangers have been here since 1994, the year after Nolan Ryan retired, but his name is still found all over the place as he is the CEO of the Rangers today. Even the hot dogs are “Nolan Ryan Beef” dogs. Nolan Ryan has always been a favorite of my cousins*, and since I’m a handful of years younger, that’s probably the primary reason he’s been a favorite of mine over the years as well. * – This might get a bit dicey trying to reference Nolan Ryan and my cousin, Ryan, in the same post. If you get confused, I understand. I’m trying my best to wordsmith so it’s clear. I do the same thing when I’m trying to avoid using the possessive form of Jesus’s name the name of Jesus in the possessive. It’s funny how things like that rub off on you. Someone in your life you look up to likes something? Well, it’s only right that you adopt that thing too. Oh, you like The Eagles, Dad? Yeah, me too. Oh, you drink coffee, Mom? Yeah, me too. Oh, you like Nolan Ryan, cuz? Yeah, me too. It’s amazing how influential those people we admire truly are in our lives. I think if we all took a moment to think through our interests, careers and values, we could trace them all back to someone in our lives who modeled it for us. Another individuals who I looked up to as a high schooler was my small group leader, Rapley, who now teaches accounting at the University of North Texas, and drove 45 minutes down from Denton to come to the game last night as well. Rapley spent four years – freshman through senior year – committed to my group of friends at the church we grew up at. He was there week after week. Rapley wasn’t a youth pastor – he was an accountant in KC during those years – but he was present and committed to our group, and I looked up to him and he helped pastor me anyway. Rapley was a K-State graduate, and he loved throwing around the Alf phrase, “Relax Willie, no problem!” I was too young to know the reference (and I still don’t really know it), but the guys in our group picked it up and worked it into our lexicon. Not because we knew the origin, but because if Rapley used it, then we wanted to too. More importantly, I admired both of these men because of the way they taught me about being a man of God. Not through their intentional words, but through the way they lived their daily lives. So the ability to be surrounded by Ryan and Rapley, both sitting with their sons, was an awesome experience for me last night in Arlington. They were spending time with me, sure, but more importantly, they were doing was shaping and forming their own sons. I think something powerful happens when dads (or moms) take their sons (or daughters) to the events they care about. It’s a creator-created relationship, and the created child is being constantly formed in the way of the Creator. I love getting to watch parents and kids interact at the ballpark. Dads teaching their sons to keep score. Moms dancing with their daughters in the aisles. Dads pointing out players and asking what number is on their uniform. Moms modeling for their sons cheers like, “Charge!” and “Let’s go [insert team name here]!” and “We want a single, S-I-N-G-L-E!” and more. Baseball, unlike other sports, provides the perfect intimate setting for these interactions to take place. There is time to discuss and teach and invest in one another. It’s not just action packed intensity like football, and it’s not as fast-paced and noisy as basketball, and it provides breaks and silence in ways soccer and hockey doesn’t. It’s uniquely conversational and perfect for formation to take place. All that to say, I loved being in the middle of these two father-son pairings. I’m thankful for these men in my life, and how they continue to model godliness to me through their love for their sons. A couple additional notes before I move on to the game itself: the Rangers sell an item called the Boomstick. Which is a twenty-four inch hot dog for $26. It comes in a carrier that folds up with a handle and can be carried like a briefcase. We didn’t get one, but the family in front of us tag teamed one and licked the briefcase clean. Also, the Rangers do a race called the Ozark Dot Race where three different color dots – Red, Blue and Green – race in from the left field warning track. It was fun to cheer for Relish Green, but then he finished last so clearly it’s rigged. The company was great, but the game itself stunk. Colby Lewis was called up to make his first start in nearly 21 months for the Rangers. He’s a pretty cool story: Lewis was a major piece of the rotation during the 2010 and 2011 World Series teams, but hasn’t pitched since July 18, 2012. He’s spent the better part of 2 years trying to recover and finally made it back to start last night. He had a respectable game. He gave up a solo homer in the 5th, and 2 runs to start the 6th. Lewis was pulled after that, and walked to the dugout to a standing ovation from the crowd. He looked sharp, which has to feel great for a guy who has worked so hard to get back there. Unfortunately, the Rangers offense was pitiful again, and only managed 1 run the whole game. They hit into 4 double plays, and only had 3 batters reach 2nd base all night. A day after watching the Braves offense exploding, I saw the Rangers bats do nothing at all against the Mariners’ Roenis Elias, who got his first win of his career. The score was 1-0 going into the 6th, and everything still felt pretty good. Even after Lewis gave up 2 runs to make it 3-0, it felt like the Rangers still had a shot. But the defense made 3 errors and reliever Pedro Figeroa gave up 3 more hits en route to a 6 run inning for Seattle. One of those errors was due to an overturned call. With the bases loaded, the Mariners chopped a ball back to Figeroa, who threw home to get the force out. The catcher, Arencibia, trying to transfer the ball out of his glove quickly and fire to first for the double play, dropped the ball taking it out of his glove. Initially, the Rangers were given the out, but Mariners manager, Lloyd McClendon, challenged the call and Seattle picked up the run instead. Then the most exciting moment of the game happened: Ron Washington got tossed. And fast. Rangers got pounded, 7-1, and Prince Fielder’s #84 did nothing to help his physique. Five down. Twenty-Five to go.